On my current project assignment, we use JDevelopper to develop BPEL process. As you might notice, JDevelopper use a hidden folder .adf where it store configuration file to acess MDS location for example (.adf\META-INF\adf-config.xml). As we use different platform (windows for development and linux for continuuous integration with Maven), you can define your adf config file to be portable in both environment. The mds.home can be defined as an environment variable in Windows and Linux system. The advantage when you use this syntax with Maven, is that it is recognized as a Maven property. Et voila, you don’t need to change .adf\META-INF\adf-config.xml anymore when you switch platform ! that match the value defined in environment variable. 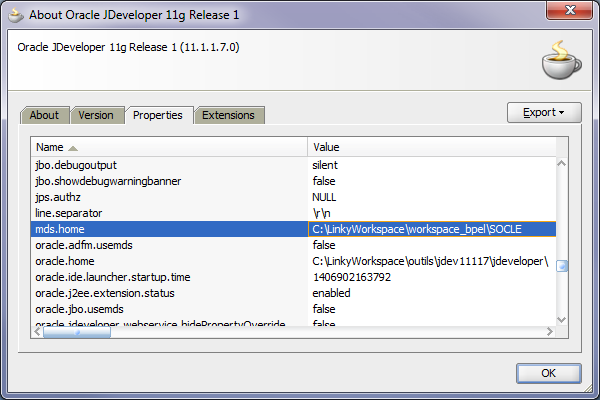 This entry was posted in bpel, config, DevTools, JDevelopper, Maven and tagged adf-config.xml, bpel, jdevelopper. Bookmark the permalink.